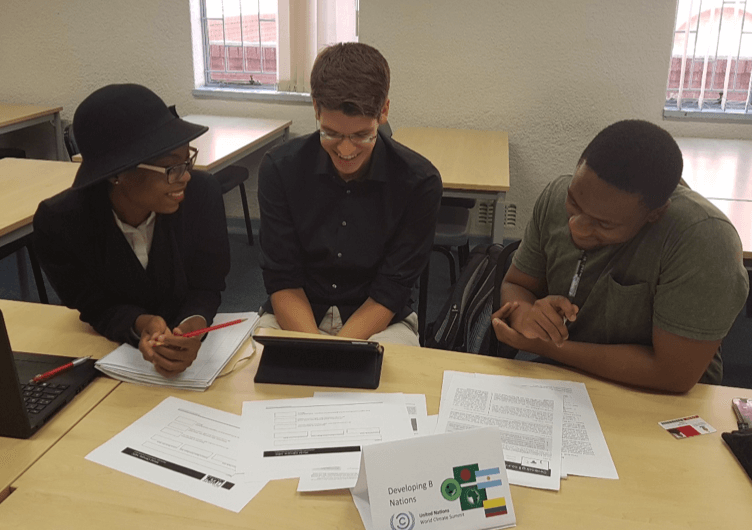 In October 2017, for a second consecutive year, postgraduate students of the module “Economics of Energy and the Environment” offered by the Department of Economics, University of Pretoria, negotiated towards a global agreement on climate change aiming at keeping the increase of temperature at 2oC compared to pre-industrial levels. 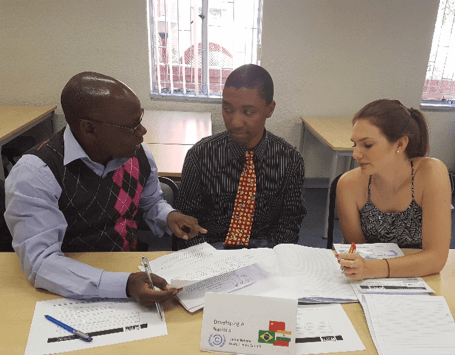 I came across World Climate in 2016 when developing the above-mentioned module and needed alternative assessment opportunities that would engage students with the taught material and allow me to evaluate their deeper understanding of topics such as climate change, emission reductions, energy efficiency etc. I got excited not only by the idea of a simulation exercise, but also by the plethora of information, guiding documents, and resource materials available online. The introduction of the session in both years was relatively short as the students were already knowledgeable about climate change issues and consequences which we tackle throughout the module. In the 2016 session, the students received their briefings on the day of the simulation. Some gave feedback afterwards that they would have preferred to have more information beforehand to be prepared. Thus, in 2017, I separated them into groups and gave them the information a couple of weeks before. The discussion took place in a lecture room adjusted to serve as a boardroom, with I being the facilitator of the mock negotiations. A 3-region mode was selected (six students in 2016 and nine in 2017). In order to illustrate the differences in resources among the different country groups, snacks and water was served for the Developed countries, dried fruit for the Developing A group and nothing for the Developing B group. The twist I introduced to get them out of their comfort zone was to assign them to country groups, opposite to their backgrounds and the beliefs and opinions they had expressed during the semester. Since now the students had to negotiate in favour of countries that they did not believe, they had to put themselves in the other side’s shoes and learn to argue both ways. That resulted in a few interesting discussions but it was remarkable to observe how aggressive and strict the negotiators were. For example, a student from DR Congo that traditionally during the semester, expressed opinions against the developed countries and stressed their responsibility to the dire conditions we experience now, had to support the developed nations’ opinion of not having to carry all the weight of the emissions reduction. The disadvantage to this was that the delegates were more eager to give up their initial pledges and positions. Jokingly, we all agreed at the end that maybe this is the future of climate change negotiations: US negotiators representing developing countries, developing countries negotiators representing China, and Chinese negotiators representing US. In 2017, this effect was not as prominent, although some students showed difficulties in representing a group not so “close to the heart”. “Although we all had the best interests at heart, particularly in the first round of negotiations, we focused and argued on financial pledges that actually do not have bit impact, if not followed by emissions reduction commitment and action. As such, we did not achieve the goal temperature as much as we should have. To move from 4.5oC to 2oC [where we only moved down to 3oC after the second round of negotiations], we should have actually spoken more about the effects of our annual emission reduction rates and there should have been more urgency in terms of the years we take to stabilise, particularly the Developing A nations are guilty as charged. I do wish we could also see in the simulation the effect of technological improvements of the developing nations in that time, such as energy intensity improvements, and how that could have amplified our pledges in terms of moving towards the target temperature”. “Four factors appear to quicken mitigation efforts towards climate change; 1) The earlier the countries attain their GHG emission peak levels the more significant the effect; 2) The sooner they commence their reduction in GHG emissions the more significant will be the effect; 3)The higher the rate of GHG emission reduction rate per year the higher the impact in reducing global temperatures and finally 4) reduction in use of oil and coal has a higher impact than reduction in deforestation”. 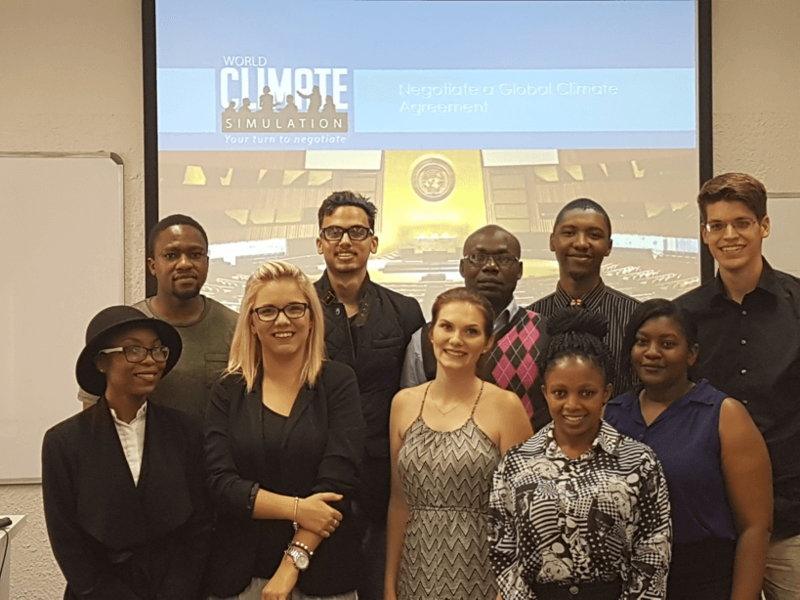 The World Climate simulation is the most interesting session of the whole semester for me as a lecturer. I observe in action all the knowledge I have transferred to my students. I am particularly proud of moments when I hear the students using theories and arguments from the taught literature and materials to support their opinions. I consider the exercise a valuable tool to respond to comments such as “but all countries agree that climate change will have extreme negative consequences, why don’t they all agree to help?”. Now my students comprehend fully the mechanisms of international climate negotiations and they have experienced in action why they are not fruitful most of the times. Being students from primarily low economic backgrounds, their focus in the negotiations has been primarily the Fund, the possible effects on economic growth (for instance, “China” argued with the Developed countries “let us grow to your standard of living and then we will come to the table to deal with environmental concerns”). 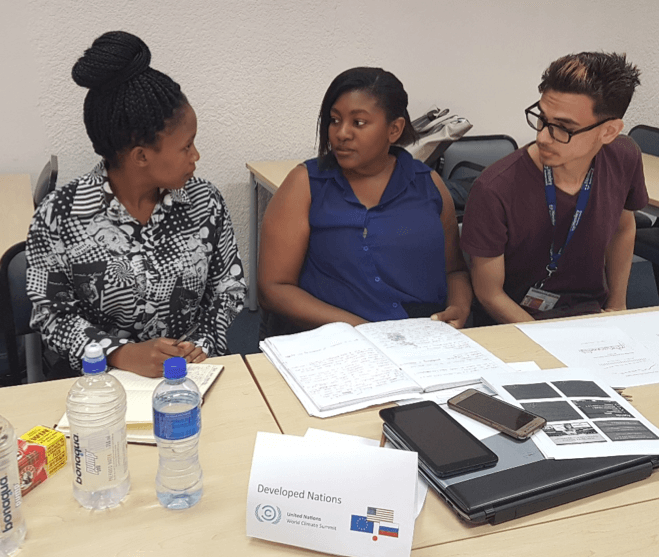 The simulation exercise will definitely continue being party of the module in the coming years not only because the students love the experience, but also because it provides an excellent assessment tool on the understanding of the topic of climate change. You can watch our 2016 session here.